Dubois is a small, western, mountain town in the Wind River valley of west central Wyoming. 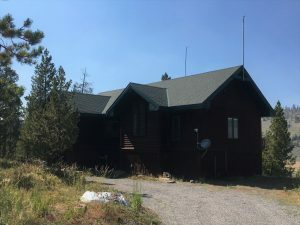 It is on the east side of the Continental Divide at an elevation of 7000 ft., surrounded by the Absaroka and Wind River mountain ranges and framed by picturesque red rock badlands. The Wind River begins as snowmelt in the mountains at the Continental Divide and flows through Dubois on its way to the Big Horn, Missouri, and Mississippi Rivers. Dubois is 90 miles east of Jackson Hole and 75 miles west of Riverton and Lander, WY. It is on the southern edge of the Greater Yellowstone ecosystem and is a gateway community to Grand Teton and Yellowstone National Parks. The Wind River Indian Reservation, home to the Eastern Shoshone and Northern Arapahoe tribes, is 15 miles east of town. The economy is based on agriculture, tourism, and public lands management. Dubois offers all of the amenities of modern life including a medical clinic, physical fitness centers, grocery store, library, numerous dude ranches, fine dining, and a municipal airport. It has an excellent K-12 school system, Fremont County School District #2, with exceptionally low student to teacher ratios. It is also home to the National Big Horn Sheep Interpretive Center, the Headwaters Arts and Conference Center, the Dubois Museum, and a lively arts scene including fine arts galleries and music venues. Many and varied year round outdoor recreational opportunities abound including excellent big game hunting, fishing, hiking, biking, snowmobiling, skiing, archaeological treasures, rodeo and horseback riding. The Dubois area has unlimited numbers of trails to explore with cherished public access to national forest, BLM (U.S. Bureau of Land Management), and State public lands. It is considered one of the most remote towns in the lower 48 states; yet commercial air service is available through Jackson and Riverton less than 100 miles away. Dubois has been voted one of the “Best Rural Towns” by American Cowboy Magazine. The 2013 US Census Bureau population is 995, in town. Residents are proud of the history and culture of this small mountain town and work enthusiastically to sustain it. No state income tax: No state tax on personal or corporate income. Dynasty trusts: You can shield your real estate from federal estate taxes for up to one thousand years. This trust must be administered in Wyoming. You can establish a trust in Wyoming for the benefit of your family or other beneficiaries. You can transfer your real estate into a Limited Liability Company or family trust, then, transfer it into the Dynasty Trust–which will continue for one thousand years. This can allow multiple generations to make use of and enjoy the property without having to pay estate taxes. No inheritance or estate tax: Wyoming repealed its estate tax January 1, 2005. No state gift tax: Real estate can be gifted to your heirs without having to pay a State gift tax. No tax on out-of-state retirement income: Wyoming does not tax retirement income which is earned outside of Wyoming. Low property taxes: Wyoming has low property taxes compared to other states. No excise taxes: Wyoming does not tax prescription drugs or food for home consumption. No tax on mineral ownership: Wyoming does not tax mineral ownership. No intangible taxes: Wyoming does not tax financial assets such as stocks and bonds. Wyoming has been cited by Bloomberg Wealth Management magazine as the most tax friendly state in the country. Note: A tax planning professional should always be consulted to gain full understanding of the tax regulations as they pertain to your specific circumstances.